Colorado’s immigrant-owned businesses generate a whopping $684 million a year in revenue, according to a five-year average from the American Community Survey. According to a recent study conducted by a research organization in New York, there are over 13,000 immigrant-owned small businesses in Colorado. DENVER –	Colorado’s immigrant-owned businesses generate a whopping $684 million a year in revenue, according to research conducted by the American Community Survey. There are over 13,000 immigrant-owned small businesses in Colorado according to a recent study conducted by the Fiscal Policy Institute, a research organization in New York. The report, Immigrant Small Business Owners: A Significant and Growing Part of the Economy, details the number and characteristics of immigrant small business owners across the country and Colorado’s number of immigrant owned businesses, specifically, is an ‘unexpected finding’ said Kathy White, deputy project director at the Colorado Fiscal Policy Institute. Another interesting finding, the report says, is that Denver Metro immigrants are 10 percent more likely to own a small business than their U.S.-born counterparts. The study used data from the U.S. Census Bureau’s American Community Survey. The $684 million in earnings from immigrant-owned businesses is based on revenues from 2006 to 2010, the publication reports. The study defined small businesses as firms with fewer than 100 employees. In the United States, small businesses employed 35 million people in 2007, accounting for 30 percent of all private-sector employment, according to the most recent Survey of Small Business Owners reported in the study. A prime example of a successful immigrant owned Denver Metro business is Loris and Eddie Zarooki’s auto shop located just north of Littleton, Colorado. This year, the Zarooki’s decided it was time to build newer, larger space, all thanks to using prefabricated building materials from local company Armstrong Steel Buildings. Owners Eddie and Loris Zarooki came to Denver in search of opportunity. While it is true that 100 years ago, during the industrial revolution, immigrants were coming to the U.S. to fill general labor jobs to improve the economic position for themselves and their families, a lot has changed since then. These two business owners had a very specific idea of what they wanted when contacting Armstrong Steel to expand their business. They envisioned a clear span building with enough bays to accommodate the increasing workload their business has been experiencing. As Iranian immigrants, the Zarooki’s are, without question, an American success story. “The fabric of our nation is woven by the immigrant experience and its colorful patchwork is a living witness to America’s success. On the whole, America & Denver is reaping the benefits of our immigrant-friendly economic and civic structure.” says Eric Beavers, VP of Operations for Armstrong Steel. Being familiar with construction, the Zarooki’s knew the advantages of metal buildings and knew an Armstrong Building would be an extremely cost effective solution for what they envisioned. They contacted Armstrong Steel with their idea and Armstrong’s team of experts suggested their 70x60x14 package, which included doors, skylights, gutters, downspouts, and insulation. “Every time I’ve shown up to Armstrong Steel’s Headquarters in the Denver Tech Center to discuss a building project with the project managers they are accommodating, efficient, priced right and they take care of our needs.” says Shane Mostashiry, a prominent Denver area general contractor managing the project. As the Zarooki’s business continues to grow, they plan to stick with Armstrong for any future expansion needs. “We initially sent a building deposit to a well-known steel building company in Denver who we later learned had an established reputation for stealing people’s deposits and not delivering buildings. That was a huge mistake because we never got our building and they still have our money. Our first call should have been Armstrong Steel.” Loris Zarooki said. “Armstrong Steel is proud to contribute to building this land of opportunity for all persons living within our borders, especially those who came to our country in search of opportunity. 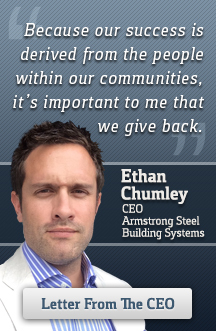 Their hopes and dreams strengthen our own communities, and remind us that the great expanse of our country was built by hands from foreign lands.” said Ethan Chumley, Armstrong Steel’s CEO.